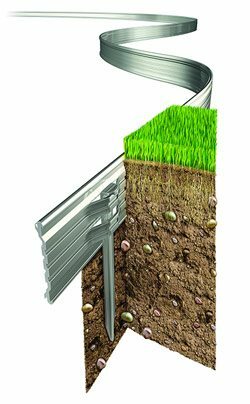 High quality and durable, Rite-Edge is a multi-award winning solution for lawn edging, garden edging, landscape edging and more. Designed by landscape architects, it is often specified in professional landscape designs for lawns, borders, beds and pathways, giving perfect straight edges, sharp corners and flowing curves and shapes, keeping that pristine neat garden appearance. Aircraft Grade Aluminium Alloy designed to last a minimum of 27 years is used to manufacture Rite-Edge, which means no rust, no staining and no painting to worry about. Barbed fixing stakes are used to hold Rite-Edge securely in place. Lightweight and easy to handle, Rite-Edge comes in long lengths and with its unique telescopic design, installation is neat, fast and easy. The Rite-Edge profile features a castellated body to give maximum strength for heavy lawn mowers and prevents lifting by frost, in addition a smooth rounded top edge means no accidental cuts and no damage to lawn mower blades. Stand back with pride and admire that permanent “Just-Edged” look without all those hours of back-breaking edging spade and shear work. Available as a Retail pack, suitable for small gardens and landscape areas, or as a Full pack suitable for larger areas.